Nina Burke is a multi-media artist who has been at the Bough and Dough Shop in the past for her polymer clay work. 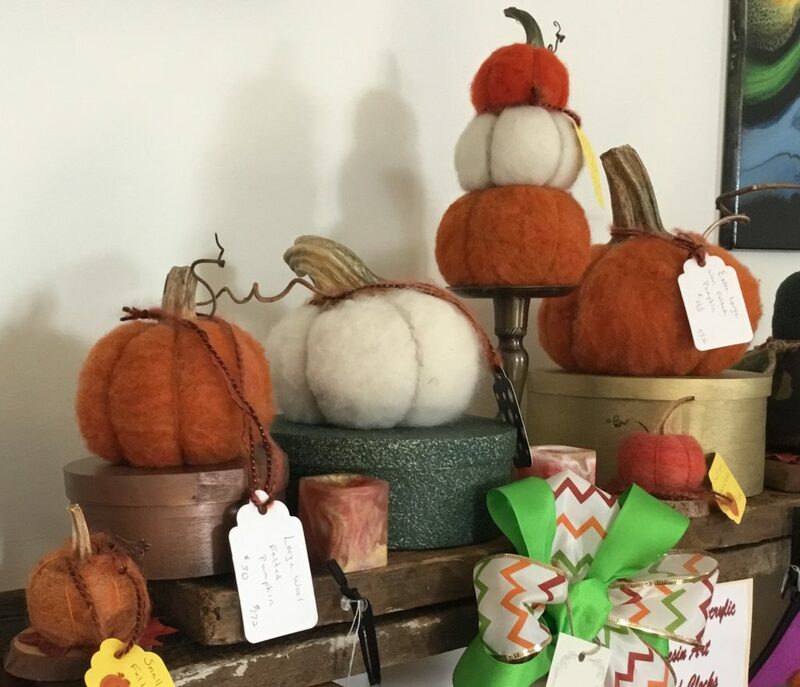 This year, Nina has brought a bevy of painted gourds with embellishments for your home decor needs. Browse her Santas, snowmen, angels, reindeer, and barnyard animals. You are sure to find one that delights you. The Bough and Dough Shop is located at the Hexagon House, 530 Amherst St. in Winchester. The Shop is open Tuesday-Saturday, 10 a.m. – 5 p.m. and Sunday noon – 5 p.m.
Libba Pendleton is one of our new artists for the shop this year, but her felted work is timeless. 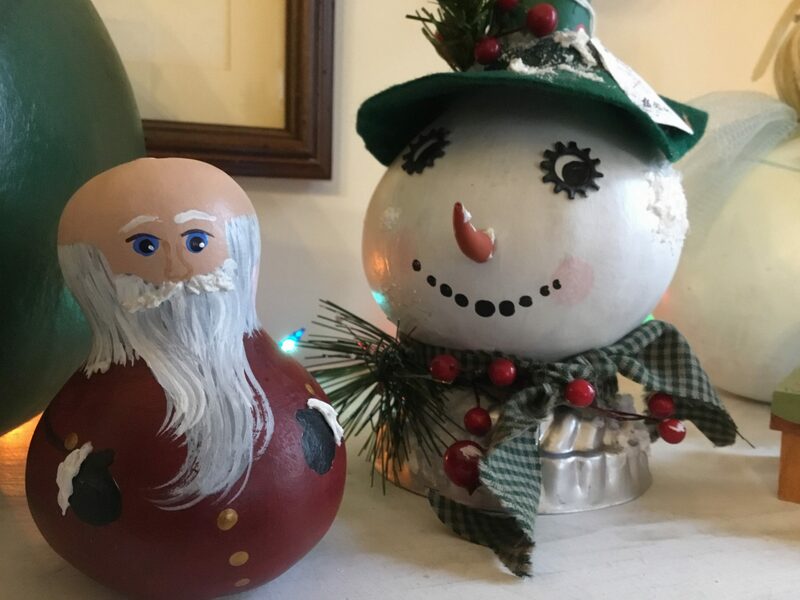 Her work, including both sculptural pieces and wearable art, is displayed in the windows in the parlor, and her ornaments are also in the tree in the dining room. The seasonal table is also located in the parlor and holds the pumpkin brigade and the small handcrafted beer journals. 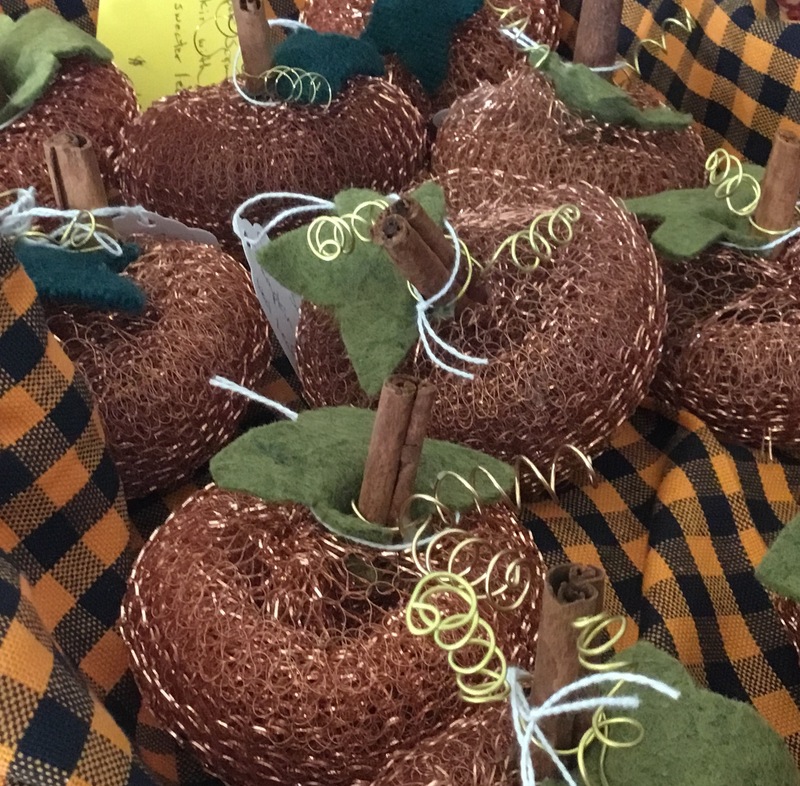 Be sure to stop in Friday or Saturday if her pumpkins catch your eye – they will be heading out soon to be swapped with winter themed items. We know many people are super curious about the upstairs at the Hexagon House. 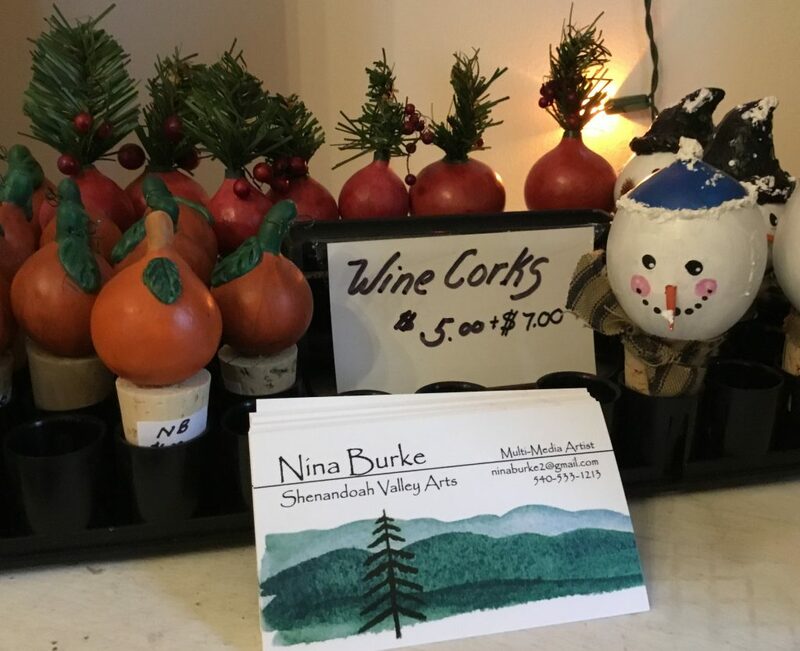 Our upstairs neighbors, Shenandoah Arts Council, will host an open house upstairs on Nov. 28, 10 a.m. to 5 p.m. concurrent with the downstairs shop hours. Take this chance to meet and greet our new neighbors and learn about their programs! You can find more information at their website. Norma Fredrickson is one of our new artists for 2018. 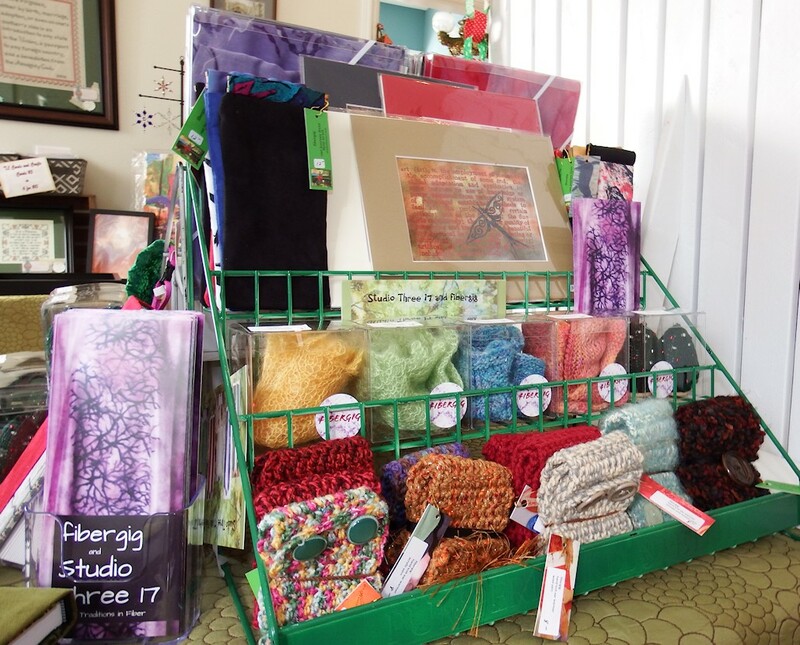 Fibergig and Studio Three 17 offers a variety of transformed fiber products, including silk scarves and bow ties, pet collar bandanas, small fabric pouches and goodie bags, tree skirts, ornaments, and matted art. Many of you may know her from her work for stoles, chasubles, and hanging banners for local congregations. Fibergig’s main table is set up in the parlor of the Hexagon House, with some of her tree skirts on display with the Christmas trees set up through the house. Her ornaments are displayed on the Christmas tree in the dining room. Stop by to see her work, and that of many other artists, at the Bough and Dough Shop, open Tuesday-Saturday at the Hexagon House, 530 Amherst St., 10 a.m – 5 p.m. We will be closed for Thanksgiving! You might have a full day of tours on December 1 and 2. If you need some ideas for lunch or dinner before or after touring the homes, check out these businesses, courtesy Old Town Winchester. Many are located within easy walking distance of the tour sites and ticket sale locations. Be sure to call ahead or visit oldtownwinchesterva.com for more information on each establishment below – and even more that did not make the printed booklets. The Final Yard, 33 E. Gerrard St.
Kimberly’s, 135 N. Braddock St.
Winchester-Frederick County Visitors Center, 1400 S. Pleasant Valley Rd. Bough & Dough Shop at the Hexagon House, 530 Amherst St. The Paypal “continue shopping” glitch mentioned previously appears to have been resolved. Make sure to save your receipt from PayPal until you get your tickets in hand! You can always contact us at 540-667-3577 or phwinc.org@gmail.com if you have difficulty checking out. The following two items are extra bonuses during Holiday House Tour on December 1 and 2. You do not need to join a group for a walking tour if you do not want to. You can still visit the sites in any order and on your own as you have done for past Holiday House Tours. Centre Meeting House, 203 N. Washington St.
Bank of Clarke County, 202 N. Loudoun St.
Last guides leave at 4 p.m. 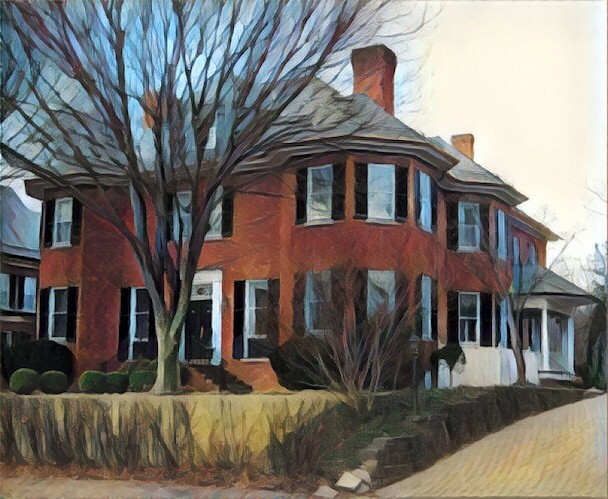 Explore the history and architecture of the northern end of the Winchester Historic District with guided exterior walking tours. There are two tour routes this year, linked by Peyton Street. 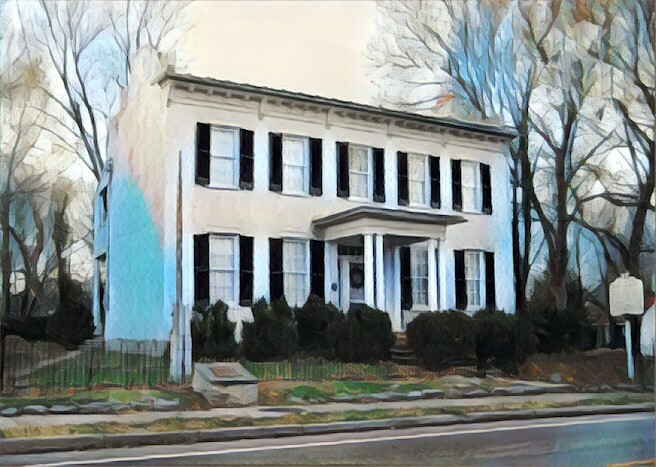 In the first route, meet a guide at Centre Meeting House to walk along the 200 and 300 block of Fairmont, ending at the Peyton Street intersection and the home of Jay Smith and Allison Young. From here, you can make a loop from Peyton, Braddock, Fairfax, and back to Centre Meeting (about ½ mile). In the second route, starting at the Bank of Clarke County, you will head north on Loudoun Street to see a neighborhood beginning its renaissance, passing the Fort and the Well at the Baker-Hardy House and end at 501 North Loudoun Street, the future home of Pizzoco in a former Conoco gas station (about ¼ mile). Look for guides near the intersections of Peyton Street with Loudoun, Braddock, and Fairmont to join the tour routes and open sites (Peyton Street is about ¼ mile between Fairmont and Loudoun). Please note the sidewalks are under construction in the Fairmont area and the surfaces may present trip hazards in some locations. The neighborhood is located on a hill and you will ascend and descend at points in your walking tour. There is also one flight of steps at the intersection of Peyton and Loudoun Streets. If the sidewalks are still under construction the weekend of the tour, the Fairmont loop may be shortened or rerouted. November 30 and December 1: 1-8 p.m.
Make the Patsy Cline Historic House a part of your holiday festivity this year! Please enjoy this FREE community holiday open house event (no Holiday House Tour ticket needed!) in a gesture of thanks for the ongoing support of our neighbors and friends. 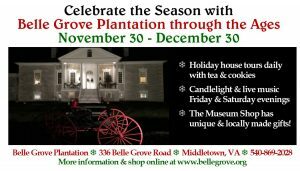 Take a break from the holiday frenzy to relax and enjoy the season with a bit of history and family tradition. Patsy Cline’s home will be decorated as it was when she lived there in the mid 1950s with her mother and siblings. 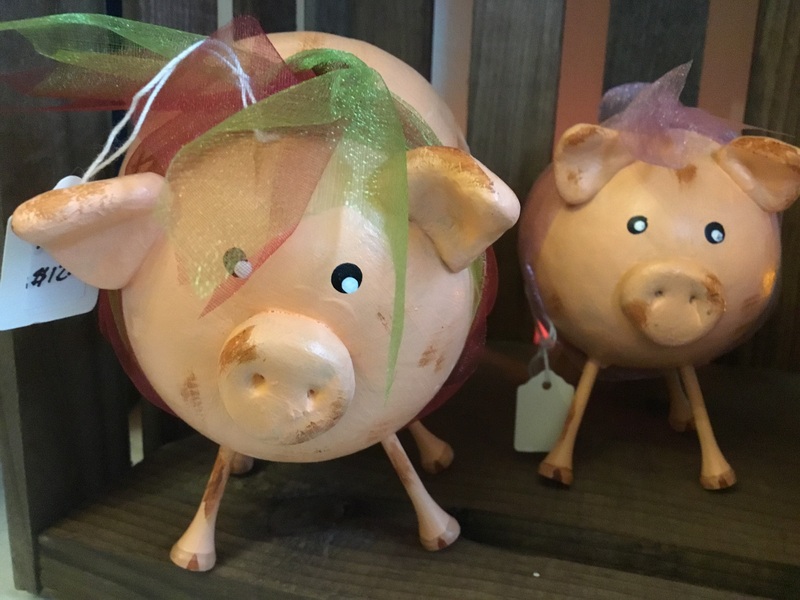 Browse the house and do some Christmas shopping in the Gift Shop. Register for an opportunity to win a gift basket worth $200. The house is open for these special tours on Friday, November 30 and Saturday, December 1 from 1 p.m. to 8 p.m.; and on Sunday, December 2 from 1 p.m. to 5 p.m.
Last tour will begin at 30 minutes before closing, no tickets necessary. House occupancy is limited to 18 persons at a time. Visitors may experience a short wait before admittance. The complimentary holiday house tours are offered by Celebrating Patsy Cline, Inc., owner and operator of the Patsy Cline Historic House. CPC is a non-profit organization based in Winchester, VA whose mission is to preserve and perpetuate the legacy of Patsy Cline and her music. Be sure to visit them on Facebook for possible updates on this bonus house tour. After exiting the Fort, you will have the chance to see one of the last remaining pieces of Fort Loudoun – the well that once served Fort Loudoun. The French and Indian War Foundation was formed in 2002 to increase public awareness of the impact of the French and Indian War on colonial America and to preserve the sites, documents and artifacts associated with the conflict on the Virginia frontier. 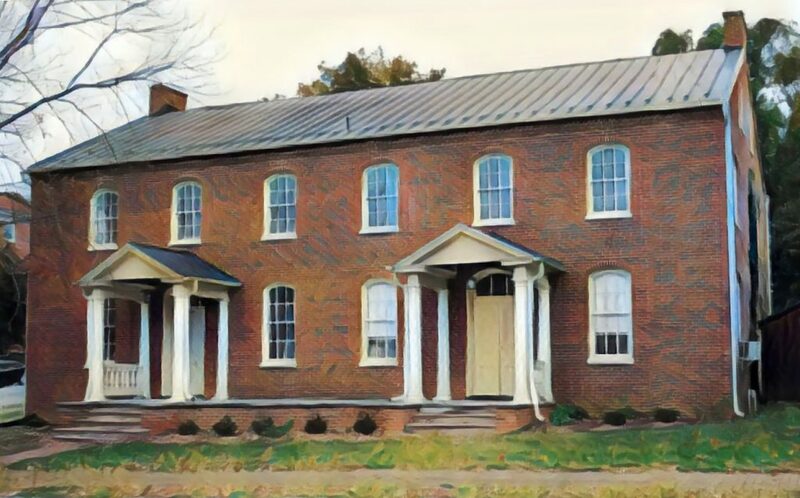 In 2002 the foundation acquired the property at 419 North Loudoun St. in Winchester, which encompasses the site of the northwest quadrant earthworks of Fort Loudoun and the fort’s well. The well, excavated at the order of George Washington, is 103 feet deep and was blasted out of solid rock by John Christopher Heintz from 1757 to 1758. Several archeological excavations at the site have revealed numerous period artifacts which include bits of glass, ceramics, musket balls, and bayonet parts as well as animal bones, and part of the north barrack’s foundation. Representatives will be on hand Saturday for exterior tours around Washington’s Well at Fort Loudoun in period attire. In 1756, the Virginia House of Burgesses approved the construction of a chain of forts to defend the colony’s frontier. George Washington oversaw the construction of Fort Loudoun on this prominent hill overlooking the downtown. The fort, built of horizontal logs filled with earth and rubble, never saw action, and much of the lumber was reused in other local buildings. 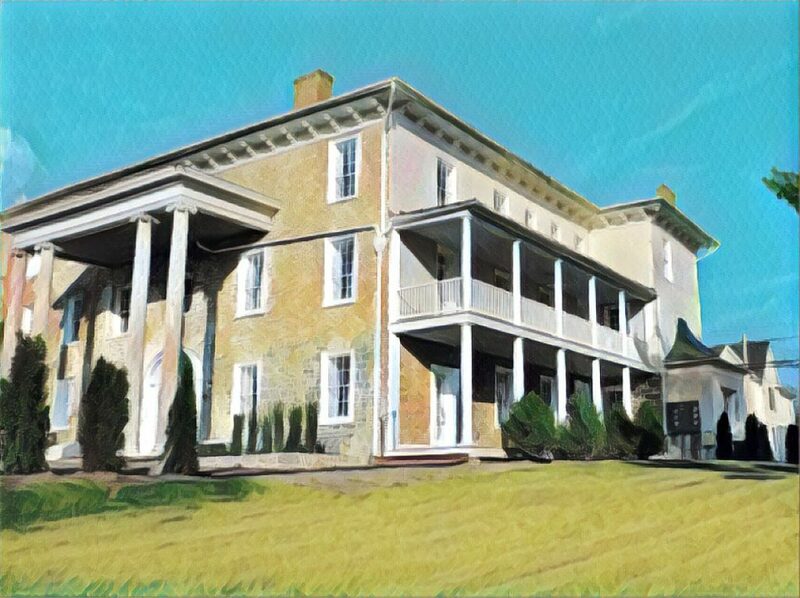 By 1830, an oyster house had come and gone on Fort Hill, and Joseph Baker started a girl’s school on the site in a rambling, Italianate-influenced structure. It continued as a girl’s boarding school until 1925 when the front part of the building was turned into apartments and the school became a day school for boys and girls. On February 4, 1955, there was a fire at the property, which closed the school permanently. Irvan O’Connell bought the former school and converted it to apartments. During the renovation, he incorporated a double story entry portico, several arched fan windows, and the front entry doors from the recently demolished Hotel Jack on Piccadilly Street. The Fort began a new phase of life in 2016 with a renovation to convert the apartments into luxury condominiums. You can find more information at thefortcondoswinchester.com. Three floors and multiple units of this expansive building will be open for tours, including the furnished unit of Stan and Jan Corneal. Light refreshments will be hosted in the northwestern wing, along with artifacts discovered during the renovation. The building has an elevator for easier access to the upper floors. The visually unique transitional style from Queen Anne to Colonial Revival found in this home was the product of noted Baltimore-based architect Joseph Evan Sperry in 1895. The home is typical of Sperry’s work, which reflects the changing taste from the end of the Gilded Age to the early Progressive Era of American history (1870s-1920s). In keeping with Sperry’s typical clientele, the home was built for Thomas Jefferson Cooper, a local wholesale grocery businessman. The Cooper family owned the home until 1965. This prominent dwelling acts as a visual terminus to Peyton Street at its junction with Fairmont Avenue. The paired Queen Anne-style turreted corners flank the Colonial Revival entrance, built about 1965 to replace an earlier rectangular covered porch. Inside, the house has been altered to keep up with the changing times, including removing the butler’s pantry to enlarge the kitchen, a redesign of the central hall, and the installation of stained glass in the central hall inner doors by John Orlich. The current owners purchased the home in 2010. 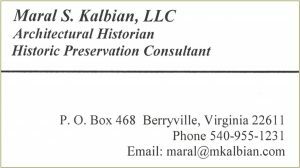 Be sure to thank our final Holiday House Tour sponsor for 2018, Maral Kalbian. 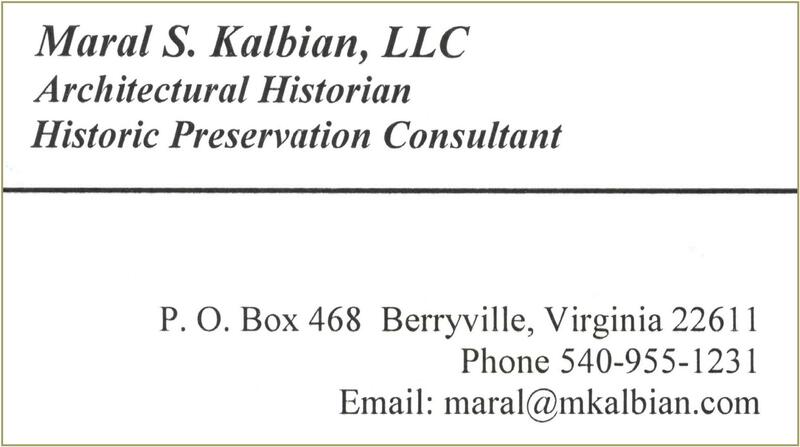 Click the image to view her business card full size, and contact her if you have questions pertaining to architectural history and historic tax credits. The Centre Meeting House is one of two historic Quaker meeting houses in the Winchester/Frederick County area. It was built in 1872 by Winchester Centre Meeting of the Religious Society of Friends. This is the third meeting house used by Winchester Centre Meeting, which was established in 1776. The first location was at the southwest corner of the intersection of Valley Avenue and Jubal Early Drive until about 1820. The meeting then moved to a location in the 600 block of South Washington Street. After this building was destroyed during the Civil War, the meeting moved to the current location. At the center of the building is a folding wall, which divides it into two rooms. The paneled wall at one time could be raised or lowered by a crank located above the present ceiling. Until the late 1800s, separate men’s and women’s business meetings were held. The wall could be raised for meeting for worship or lowered for the separate business meetings. In 1999, Winchester Centre and Hopewell Monthly Meetings joined together to form Hopewell Centre Meeting. Meetings for worship are held at Centre as well as the Hopewell Meeting House near Clear Brook. The Centre building is also used for many community purposes. You may visit them on Facebook for more information on Hopewell Centre Meeting and their two historic meeting houses. The Friends have graciously opened their yard at Centre Meeting for Holiday House Tour visitor parking. This will be the closest parking lot available for Fairmont Avenue, as there is no on-street parking for that street. We anticipate being able to serve hot drinks at Centre for our guests as well. Please thank today’s highlighted Holiday House Tour sponsor, Belle Grove Plantation. 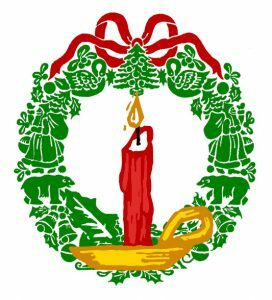 They are hosting their own holiday event this year – be sure to visit them while you are taking in the Winchester festivities! Click on the ad to see it full size or visit their website and Facebook for all the details.